Swamps and Bogs and Quagmires! Oh My! What do marshes, swamps, bogs, fens, quagmires, muskegs, sloughs, moors, and bayous have in common? These are all different names for wetlands. When you hear these terms, you may think that they refer to mysterious, soggy areas filled with snakes, alligators and all kinds of terrifying creatures. 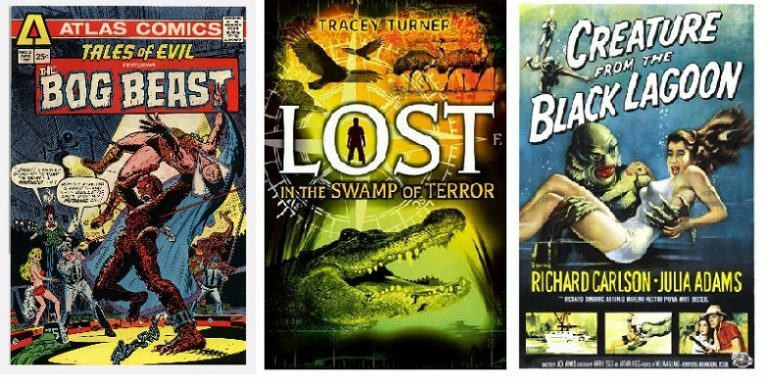 The purveyors of popular culture have made millions of dollars selling comic books, novels, and wetland-based horror films like The Bog Beast, Lost in the Swamp of Terror, and the kitschy classic Creature from the Black Lagoon. Comic books, TV, and movies love the mysterious settings of wetlands and swamps and fill them with finny, toothy terrors. But swamps, marshes, and bogs are more than low-value land. Wetlands are some of the most important areas on Earth because they fulfill a critical role the natural order. Wetlands are not only useful, they are popular as well! Every year thousands of people visit wetlands like the Louisiana bayous, the Florida Everglades, and Wisconsin’s Horicon Marsh Wildlife Refuge to hunt, fish, boat, hike, and to observe migratory birds and wildlife. Wetlands are even part of classic literature. 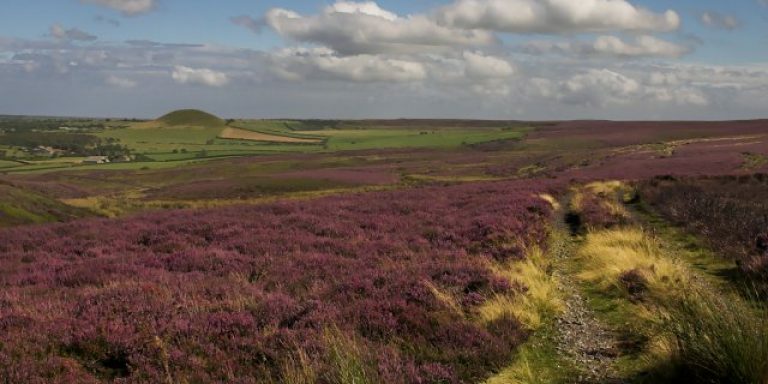 Some of the most famous wetlands in the world are the Yorkshire moors, the setting for Emily Bronte’s novel Wuthering Heights. Rivers, lakes, and streams are not wetlands, but they may have areas surrounded by wetlands or they may move through wetlands. Ocean shorelines may also contain wetlands. Wetlands collect and store stormwater runoff, they filter pollutants and purify water, and recharge groundwater. Wetlands can help moderate the periodic heavy flows of streams or rivers during spring snow melt and can reduce flooding and erosion of areas downstream. Wetlands provide habitat for amphibians, reptiles, waterfowl and wading birds, and water loving mammals like beavers, muskrats, mink, otters, and raccoons. Even deer, bear and moose are known to make use of wetland habitat for food and shelter. Why should wetlands be protected? Because the function of wetlands is to filter stormwater, floodwaters, and groundwater, damage to wetlands or loss of wetland areas can result in a loss of water quality, damage to fish and wildlife habitat, and can lead to flood damage to culverts, roads, bridges, and property in downstream areas. Coastal wetlands protect coastlines from ocean waves and storm surges. Wetlands provide food for all forms of life. Organic materials like leaves and grasses are broken down in wetlands and become tiny food particles for small fish, shellfish, and insects. These creatures in turn are food for larger fish, amphibians, small birds, and rodents – which are eaten by reptiles, birds of prey, and small carnivores like mink, raccoons, and foxes. The abundant shrubs and grasses near wetlands attract deer, elk and other grazers who become dinner for the top of the food chain animals – bear, wolves, cougars and of course, humans. Wetlands are critical “rest areas” along the flyway for millions of migrating birds; places where they can stop, rest and eat. Wetlands provide the ideal conditions for fish to spawn and for young fish to grow and mature. Shrimp, clams, crab, and oysters all live and reproduce on coastal wetlands. 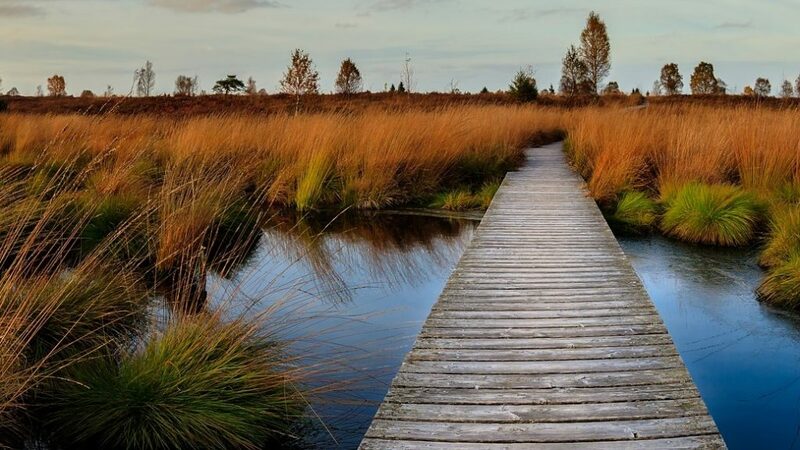 In future blog posts, we’ll look at what makes a wetland a wetland (it isn’t just soggy ground), the various types of wetlands, and the methods being used to preserve these valuable areas.